When you’re building wealth by saving and investing, one of the things that can help you save much more rapidly is earning more. 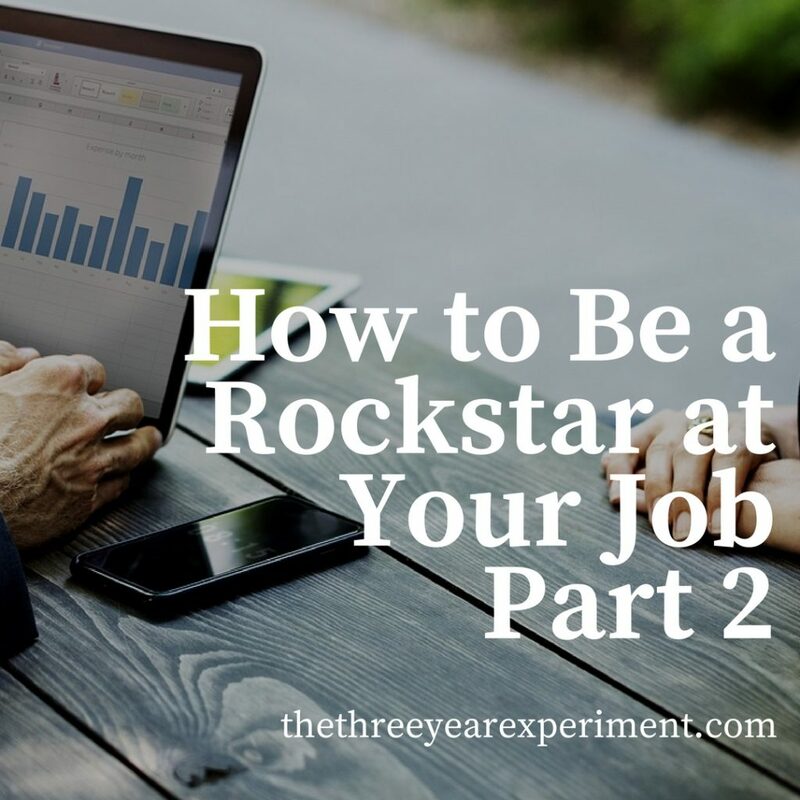 In Part 1 of “How to Be a Rockstar at Your Job,” I detailed three ways Mr. ThreeYear and I have been able to increase our wages over the years: taking responsibility, working as contractors, and tooting our own horns. Today, I’ll offer several more ways we are able to become rockstars at our jobs in order to increase our salaries as much as possible. Jalpan from Passive Income Engineering cited finding a mentor as one of the key ways he’s been able to progress in his field in intellectual property. A mentor is a co-worker at your job who’s ideally a couple of positions above you, or someone who has more experience in different areas. He or she can teach and guide you, answer questions, and generally help you become better at your job. A good mentor will challenge you, encourage you to apply for promotions you might not feel ready for, and help you understand situations that come up with your boss or peers. How can you find a mentor at work? First of all, is there someone you really admire? Someone who’s in a position you’d like to one day hold? Find a moment to ask her, preferably in person, “Are you currently taking on mentees? Because I’d really love for you to be my mentor.” If she says no, then you might ask who she’d recommend. Alternately, your boss might have some ideas for you (your mentor should not be your direct boss, by the way, as you wouldn’t be able to have the same level of transparency). You want to meet with your mentor ideally once a month, but if that’s not possible, at very least once a quarter. Each session with your mentor should be focused on specific goals that you develop at your first meeting. Usually, these goals are how to develop you as a professional. Often, your mentor will ask what you’d like to do next in your job, what competencies you need to develop, and what your strengths and weaknesses are. It’s important to focus on high-level goals, so that these sessions push you to develop as a professional. Where do you want to go next in your career? What skills do you need to take on that position? What skills are you currently missing? How could you develop or nurture those skills? The best time to negotiate is when you’re starting a new position. Women, in general, do not seem to like to negotiate. I wrote about my most recent negotiation here. In it, I sum up one of the key reasons women, and men, fail to negotiate their pay. They don’t know what they’re actually worth. Often, we’re desperate for a job and desperate to make it work, no matter the pay. However, when you’re negotiating your salary, it literally pays to do your homework. There are services (like Salary Coaching, a service for women) that will help you pinpoint a salary range for the job you’re applying for, using information from HR departments across the country. If you’re being offered the job, chances are, you’re a top performer, and should therefore be paid in the top percentage of the salary range. 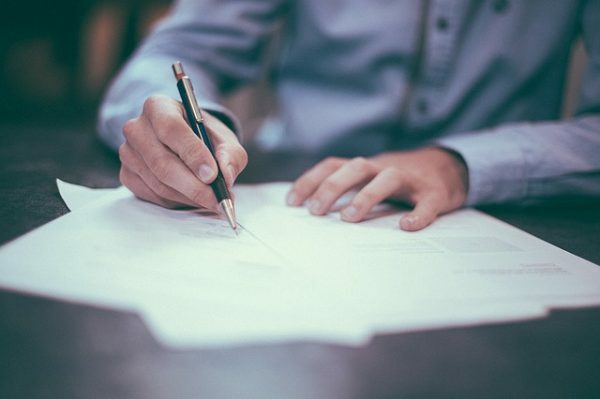 These services, which generally cost several hundred to several thousand dollars, will help you cover all aspects of the negotiation and pay for themselves several times over, especially if you’re in a high-paying profession. 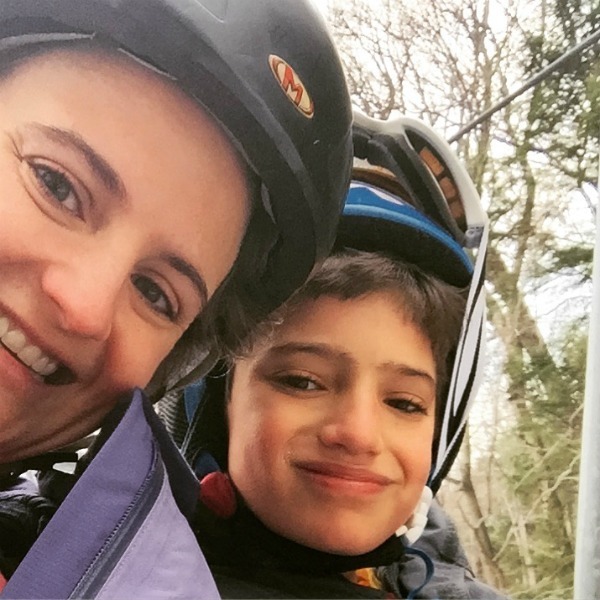 Negotiate more time off so you can take ski days with your kid! Negotiating your starting salary doesn’t just increase your current salary, it increases every raise you’ll get in the future. Let’s take the example of negotiating a starting salary from $50,000 to $55,000. Assume you receive a 5% raise every year for the next ten years. Let’s look at the difference in ending salaries between the two starting salaries: after 10 years, your original $50,000 would earn you $81,444 and change. Pretty encouraging, right? But your $55,000 would earn you $89,589, which is over $8,000 more. The results are even more pronounced with larger dollar amounts. 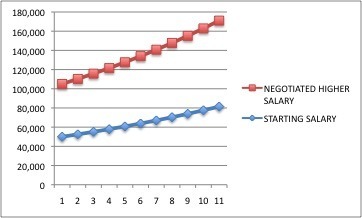 Two starting salaries over time. Many people come to negotiations with an aggressive stance, but negotiations are much more effective when you think win/win. The idea is for you to receive a salary that you (and the market) feel adequately compensates you for your effort, and for your employer to pay you a salary that is in line with what others in similar positions are receiving. You should almost never accept the first terms you’re given. Here’s why: Your employer will think they should have offered less, and you’ll be left feeling like you could have gotten more. That’s a lose/lose. Ask for more, even if it feels scary, and at the very least you’ll have more practice with negotiation than you did previously. Also think total package. Many of the benefits the company offers have a cash equivalency. So negotiate a signing bonus, another week of vacation, a higher salary if you don’t use the company’s health benefits, or a paid membership at the gym. These are all things that make your life better and can be added to your compensation package if your company can’t or won’t increase your base pay. What are some ways that you can effectively negotiate if you’re not a negotiator? Ramit Sethi has excellent negotiation tools (and videos!) on his site to get you started. When it comes down to it, your day-to-day performance on the job is going to lead you to positions with more responsibility or ensure you’ll get lackluster references when you move jobs. The biggest part of performing like a rockstar at your job comes down to being engaged. Are you at work when you’re working or are you dreaming about being somewhere else? We’ve all had times when we’re checked out at work, but if you’re constantly daydreaming, texting your new girlfriend, or shopping for furniture online, that may be a sign that you need to have a pep talk with yourself. 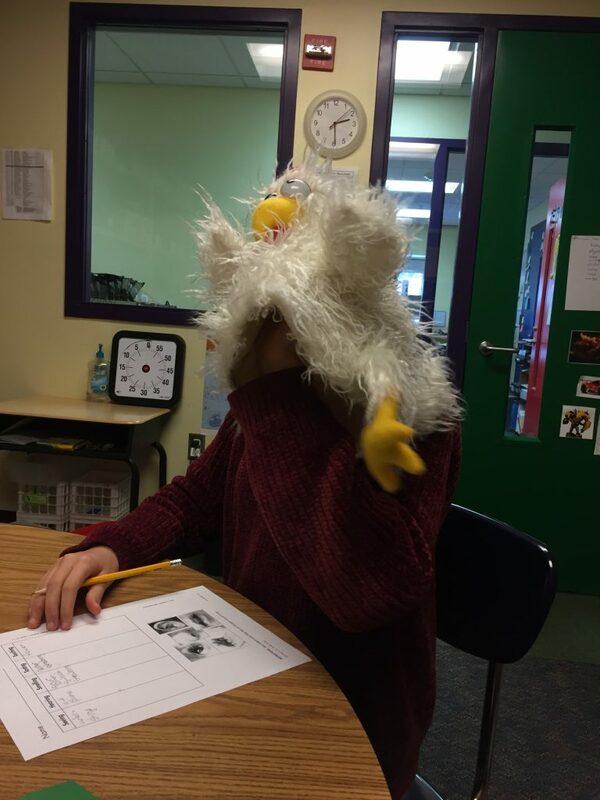 Are chicken puppets the key to performing like a rockstar? What are some of the ways to show you’re engaged? Be dependable. If you tell your boss you’ll have a report ready by 2pm, do your best to have it ready by 2pm. Send him or her weekly check-ins at the same time each week. Go to the meetings you’re supposed to go to. Manage your calendar in advance so you don’t need to take time off last minute (I myself am still working on this one. Mr. ThreeYear is great at it). Ask questions and listen. Using active listening techniques can help make sure that when you’re asking questions of people, you’re really listening to their answers rather than waiting for your turn to speak. For example, if you ask a coworker how she manages her time and she starts to tell you about a new app she’s using, repeating her words back to her not only shows that you’re listening to what she’s saying, it also helps you remember what she’s saying. Have the humility of a life-long learner. Often, if you’re able to position yourself as someone whose mission is to always be learning something new, then you’re not going to be the grumpy old guy in the room who’s the last one to adopt the new video conferencing at work. Those guys don’t want to adopt the new technology because they have no idea how to use it, and it makes them feel stupid. Truth is, the technologies in work and life are developing faster than ever, so we will constantly have new things to adapt to in the coming years. If, instead, you embrace the idea that there’s a lot you don’t know, and that you’re not, in fact, an expert at everything, you will learn so much more and develop the reputation of someone who’s teachable. My dad is great at this. He knows how to do a zillion different things (we call him the Renaissance Man) and that is mostly because if he meets someone who knows about something he doesn’t, he asks question after question. He’s not afraid to look stupid–he’s genuinely interested and wants to understand how it’s done. Part of this is because he’s a physician–doctors have to be lifelong learners if they want to stay current in their practice–and part is because he’s so excited about life. (Special thanks to Ms. Zi You, Fueled by FI/RE, Ms. Steward, Penny, Emilie, Women Who Money, and Path to Fi for their answers on Twitter that inspired this last tip)!! I don’t want to ignore an important part of earning more, which we often don’t talk about enough in the financial independence world. I had an incredible amount of privilege growing up–I had loving parents, I was part of an upper class family, and I enjoyed economic and emotional stability growing up. I had a large extended family, friends, and a church family who loved me. I was the oldest, and was therefore talked to, pushed, and listened to. I had economically stable grandparents who supported me financially. I graduated college debt free. I graduated college with a car that was given to me. My parents helped me financially well into my late twenties. I entered the work force with the “soft skills” that made me great at developing relationships with other people, thanks to my emotionally intelligent mother’s training. Because of the way I’d grown up, in an upper class family in a very socio-economic depressed Southern county, I felt comfortable talking with absolutely anyone–from the wealthiest individual to the poorest, from the most educated to the least. Mr. ThreeYear didn’t grow up with the same privileges–he grew up poor in a developing country which was ruled by a dictator for the first fourteen years of his life. However, he did have several important ones: he graduated college debt free, thanks to his mother who worked three jobs to support him. He grew up surrounded by relatives, in a loving family. He was raised by his grandmother who doted on him. Because of his ability to develop relationships, he’s had doors opened to him in the workforce that otherwise would have been closed. While Mr. ThreeYear and I started out earning peanuts (my first job in Chile teaching English paid $5.38 an hour which was “pretty good money” there), we have been able to increase our incomes so that we’re now in the top percentages of earners in this country. Our unique privileges have helped us along the way, but we’ve also worked hard and utilized the tips I’ve mentioned today and in Part 1 of this post to increase our incomes. Earning more has been the single best way we’ve been able to pay off debt and increase our net worth in the past eight years, by far. What are ways that you’ve been able to increase your salary? I’d love to hear! Hey Laurie. All great points. You can’t get ahead without thinking deeply about what it takes. Great advice! Thanks, Doc. 🙂 Writing things down helps me think more deeply in general. It’s hard to take time to think these days but it’s so important. For me the big one is keeping an eye on my end goals when I change jobs. How does each job change move me on the path to where I want to go. If it doesn’t teach me something, increase my network, or increase my pay I don’t do it. Favor learning early on and income later. Those are good points. It also helps to have those reasons in mind when you need to explain your job progressions during interviews. I agree with you that learning early on can really help accelerate your earnings later in your career. Some awesome tips there Laurie, I certainly know for one wish I knew what I know now in my twenties, then my work life would have been much, much easier. Hindsight is amazing. I’ve never had a traditional mentor relationship, mainly as I had one thrust upon in my first job, and she just didn’t get me. When I worked in consultancy I had another one that was very well meaning, but again didn’t really get me or offer any useful suggestions. Ironically he was most useful when I handed my notice in. I’ve never really sought out a traditional one since then. But I’ve had load of people I could ask advice, and some great bosses along the way to push me along. You make some good points. Mr. ThreeYear has had a couple of bad mentor relationships, too. If they’re bad they can be such a waste of time and an emotional drain! Sometimes unofficial mentors are better. Being dependable is one of life’s greatest character traits! I agree! I constantly work on this one: I have to remind myself, “Underpromise, overdeliver!.” I tend to talk big sometimes. Great story! I always say that being successful at work is a combination of getting results and having good relationships. This is a simplistic view, but people who can balance these two and do them well will usually get ahead. Thanks Michael. It really does pay to do a good job. Even just bringing a happy attitude to work each day does wonders for your productivity and the climate at the office!